ty's kitchen: Ramps Are In Season! Ramps! Oh, you wonderful gift of nature. You pop your heads out once a year for a short time, and you're the talk of the town. If only popularity was so easy for everyone else... Ramps are a really wonderful and short lived variety of onion. I was at the farmer's market this weekend in Union Square and picked of a bunch of ramps along with some chives and some quark, which is a cow's milk cheese that tastes a lot like creme fraiche. They've got a really fresh and bright flavor that's part onion, part garlic, part shallot, and all delicious. Being that ramps are in season, I wanted to make a dish that featured them and made the most of their flavor. 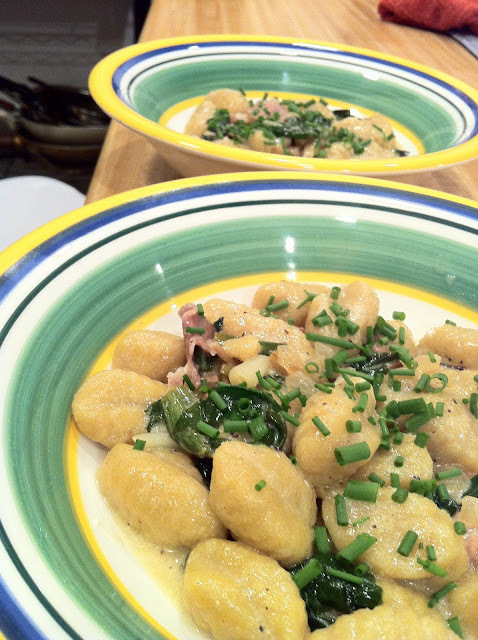 I had seen a recipe for gnocchi with ramps and speck, and I wanted to do a variation of this. My first thought was to make my own gnocchi, but it was a little late on a Sunday to start with such a labor intensive dish, so I decided to go with fresh sweet potato gnocchi from Whole Foods. WF generally has excellent homemade pastas, so I trusted them with my ode to ramps. I also picked up some prosciutto to give the dish a salty warmth. To make the dish, I cleaned the ramps and cut the white bulbs from the green leaves. I chopped half of a vidalia onion and some garlic. I cooked the onion and ramp bulbs in butter and olive oil, and once they became translucent, I added the garlic and chopped ramp greens. Once the greens began to wilt, I added the prosciutto, cooked it for a few minutes, and added about a cup of white wine and some butter. While the sauce was cooking, I boiled a big pot of water. Once it was boiling, I added the gnocchi, stirring them to make sure they didn't stick together. In about 3-4 minutes, they began floating to the top, and I drained them in a strainer, reserving a bit of the water to mix with the sauce. I mixed the gnocchi in with the sauce, added parmesan and 2 spoonfuls of the quark, tossed so everything was mixed together. I served the dish with a little chopped chive, and it was a total success. The ramp flavor worked perfectly with the prosciutto and the nutty parm and sour quark, and the gnocchi were light and fluffy. Gnocchi dishes are normally heavy, but with this dish, they were very light and tasted great with the sauce. If you can get your hands on some ramps before the season is up, take advantage of it, they are really a rare treat. Is it snooty to define a dish as "deconstructed"?